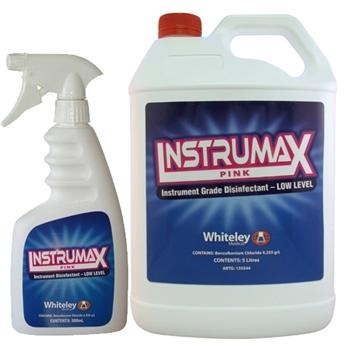 Instrumax® Pink is the only approved instrument grade disinfectant, low level, within Australia. Instrumax® Pink helps reduce the risk of cross infection and is suitable for numerous applications. Reduce the risk of bacterial cross infection by using Instrumax Pink, Australia's only instrument grade disinfectant - low level! Instrumax® Pink is approved for use on Non Critical Medical Devices including stethoscopes, thermometers, blood pressure cuffs, tourniquets, humidicribs, MRI machines and Nebuliser face masks commonly used in the treatment of Asthma medicines and inhalants. Available in 5L and 500ml Spray. Instrumax® Pink is also suitable for a wide range of non medical applications including training masks, mannequins used for CPR training, self contained breathing apparatus, as well as MedelNeb, Airssential or Rapidflo Nebulisers. Click here for Instrumax Pink MSDS. 1. Thoroughly pre-clean the device or non-medical instrument in warm water with Neutral Detergent (Sonidet or Matrix) according to manufacturer instructions. 2. Apply INSTRUMAX PINK liberally on to all parts to be disinfected and leave moist for 10 minutes OR soak the parts directly in the solution for not less than 10 minutes. 3. Rinse off thoroughly with clean running water and discard the used solution to the sink/sewer. 4. Do not re-use the solution. The use of gloves is recommended whenever using disinfectants. INSTRUMAX PINK is not intended to be used on Semi-Critical or Critical Medical Devices.